Most people reading this will spend a good proportion of their income on energy – lighting and heating your house or apartment, running appliances, fueling your car, and other things. What if you could cut these coats to almost zero and spend this increasing pile of money on, well.. anything else? Technology is at a point where anyone can save significant amounts of money and energy in their lives. The Energy Mohawk is a quest to reduce the amount of money we spend on energy to practically zero and show the simple steps on how to do it. Imagine a life where you spent your money and time on what you actually want to spend it on, rather than working to spend needless money on petrol, gas, light and heat. We will understand energy across all its forms and use this super-knowledge to be free from energy bills, to spend money on increasingly run-away savings allowing us to spend more money of things which reduce energy costs further. We will no longer worry about oil and gas price increases, or how middle east geo-politics will affect the cost of our commute to work – we can spend that time thinking or doing what we actually want to do. Finally, we can have a lot of fun understanding how things work and getting away from needing to pay other people to do relatively simple things that we can just do ourselves. So here we go. We have the power to free ourselves from the treadmill, let’s do that. Put in an energy monitor so we can see what’s consuming and costing us what, and how much we’re saving with these updates. Air source heat pump – magical “free” energy! Selling energy to the grid. The final frontier – actually making money from energy and beyond. Retirement on energy income, invested energy cost savings and super-low living costs. Step 1: Understand how much energy you consume in your life. 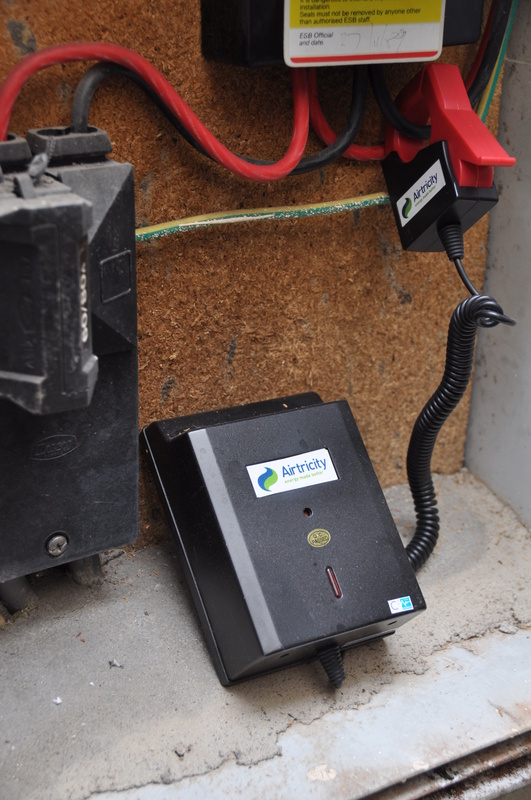 he journey in reducing your energy costs to zero starts here. You can’t reduce what you can’t measure. This step alone has been shown to reduce the buyer’s energy consumption by an average of 5-15%. 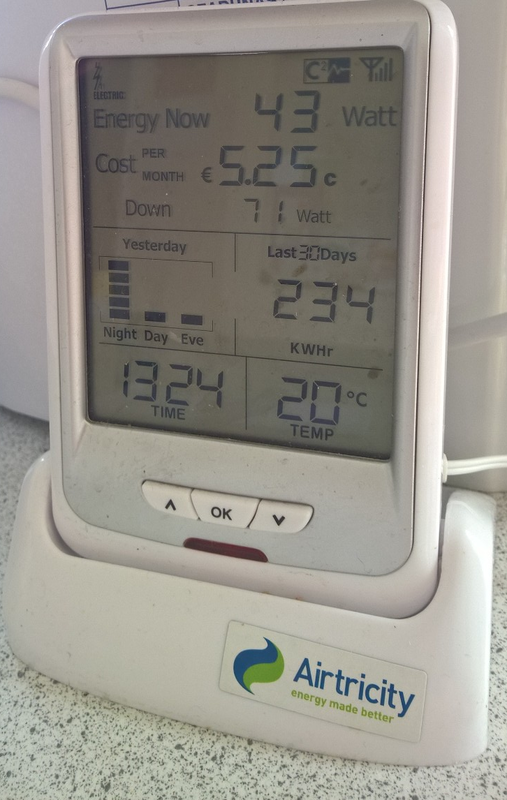 Given the average energy bill is about €850 ($1000) per year, that means your €40 ($50) investment in an energy monitor will save you €127.50 ($150) per year, every year for the rest of your life. If you’re 30 now and you plan to live until you’re 90, that’s €127.50 * 60 years = €7,650 ($9000). Not bad for a $50 investment. And we’re only just getting started! Clipping the sensor onto the cable into your home is easy. Fancy charts showing what was using how much, and when. So that was easy! Now we know what we’re consuming and paying for. It’s quite easy to see which appliance, light rig, etc is consuming what and how much it is costing. Now we have the information we need to move forward and start saving money. Kudos on setting up this website. I like your energy saving plan above. I’ve done steps 1, 4 and 14 with 2 being a mix of LED and CFL at the moment. Interestingly, while the electricity consumption of my household declined from 3,500kWh in 2012 to 2,800kWh in 2014 (approx), my electricity cost in 2014 was actually slightly higher! I would expect electricity prices to rise over time generally so I target usage rather than cost. 2015 I forecast at 2,500kWh and at a lower cost as prices have come down a bit. Also, I credit most of the saving to lighting – it’s difficult to think of anything else significant I’ve changed. Using all LEDs would of course earn me further usage reductions. My gas usage declined from 12,000kWh in 2012 to 10,000kWh in 2014 due to solar panels and heating controls, however the run rate for 2015 is pointing back at the 2012 number, perhaps due to the cold spring or undiscipined tenants. 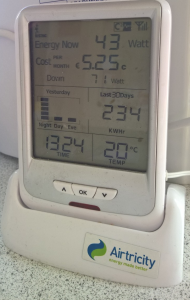 I look forward to future posts, you have inspired me to do an energy audit of my house at some point to try arrive at a breakdown of my usage into different appliances/devices. 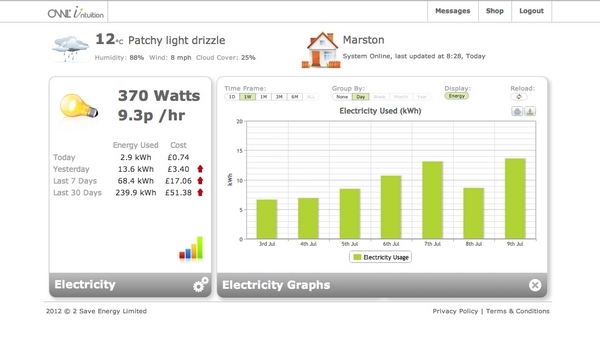 Unfortunately the energy monitor I have is a bit too basic to help much with that.